The moving process is never easy, but moving all your stuff to Hawaii is particularly challenging in that it requires not only land transport, but also ocean or air transport to get across that big, beautiful Pacific. Sell, donate, or store most of your household items. Then all you have to do is simply box up your few remaining possessions and send them to Hawaii using a freight forwarder or mail service, or pack them in your checked baggage when you fly to Hawaii. PROS: Short of hiring a full-service moving company, this is the easiest, simplest approach. And if you don’t mind parting with most of your possessions, it can also be the cheapest approach. CONS: You might be sorry later that you didn’t ship certain items when you discover you can’t find replacements in Hawaii that are as good as the originals, or that it would have been cheaper to ship the original items instead of buying replacements at higher Hawaii prices. This is the approach I took when I moved to Hawaii, and there have been many times I’ve regretted not shipping my beloved Dyson vacuum cleaner to Hawaii. Some people who don’t ship their furniture are disappointed in the selection of furniture for sale in Hawaii, most of which is decidedly “island-style” (lots of rattan, bamboo, tropical prints, etc.). Others, however, find their taste in furnishings change once they move here, and delight in the bargains to be found on Craigslist Hawaii and at the many garage sales on the islands (thanks in part to the high turnover of military residents). Coordinate each part of the move yourself. This usually involves booking a shipment with a shipping carrier and hiring two different sets of movers (one set at your old home and another set in Hawaii). PROS: You are in direct contact with each service provider you hire for each stage of the moving process, and therefore you can keep a closer eye on things. If something goes wrong, that company is accountable directly to you, not a middleman who might take longer in resolving the issue for you. Eliminating the middleman and doing more of the work yourself should also save you a significant amount of money. CONS: This is the most time-consuming and labor-intensive approach since you need to hire, coordinate, and supervise all of the service providers involved. If you plan on doing any of the actual labor yourself, you also risk bodily injury. Hire a full-service moving company to coordinate the entire move. If you are willing and able to pay a premium for their services, a full-service moving company can do nearly all the work for you. PROS: This approach requires the least amount of your time and involvement. CONS: This is the most expensive approach. Resolving any problems might take longer because you’re dealing with a middleman, who in turn is dealing with a third-party company that they’ve hired to do the actual labor. You also don’t usually have a say on which third-party companies are hired to do the work — that’s decided by the moving company. Before you hire any service providers, you should get at least 3 estimates from 3 different companies so you can compare the prices and range of services offered by each. Full-service moving companies often send an estimator to your home to take inventory of all the household items you want to ship so they can give you a precise quote. Other companies will quote you a price estimate over the phone or by email according to the information you give them. In this case, it’s helpful to use a household inventory calculator beforehand so you can tell them the approximate total weight (in pounds) and volume (in cubic feet) of all the items you want to ship. Book a shipment directly with a shipping carrier. There are 3 shipping carriers that ship household goods and vehicles from the U.S. mainland to Hawaii: Matson, Horizon Lines, and Pasha Hawaii (Pasha Hawaii ships only vehicles and oversized cargo). Additionally, there is 1 more carrier — Young Brothers — that ships only between the 6 main Hawaiian Islands: Oahu, Maui, Big Island, Kauai, Molokai, and Lana’i. See a comparison chart of all 4 carriers below. Hire a full-service moving company to book the shipment for you. This would be part of their door-t0-door moving package, and they would choose which carrier or freight forwarder to book your shipment with. Send your items through a freight forwarder. Freight forwarders use the same shipping carriers, but because they book shipments in high volume, they get discounted rates, and can pass on some of their savings to you. This is how freight forwarders can offer lower shipping rates than if you booked directly with a shipping carrier. The catch: It will probably take longer for your shipment to reach its destination, because the freight forwarder won’t ship it until they’ve gathered enough additional cargo to meet their high-volume threshold. Shipping containers for shipping household goods from the U.S. mainland to Hawaii come in the 4 sizes below. These measurements are for Matson’s containers — Horizon Lines’ and Young Brothers’ container measurements are similar. If you don’t have enough household items to fill an entire shipping container, you won’t be getting your money’s worth. Instead, you should look into LCL shipping options, which will be more cost-effective. If you have a large item that won’t fit in a shipping container, don’t fret: Matson, Pasha Hawaii, Horizon Lines, and Young Brothers can all accomodate oversized items by using flatracks or other specialized equipment. Ship the vehicle separately from your household items. PROS: You can drive your car (or have it driven) right to the port. The vehicle will be secured inside the ship by professionals to ensure it doesn’t move around during shipment. CONS: You cannot leave anything inside your car except child car seats and the spare tire/jack. You must remove all other items, including after-market stereos, speakers, and roof racks. Ship the vehicle inside your shipping container, along with your household items. PROS: You can fill the vehicle with your household items. CONS: You will have to rent a ramp or figure out another way to safely load your vehicle inside a container that’s 4 feet off the ground. Once the car is loaded, you are responsible for securing it inside the container so it doesn’t shift en route and damage the other items inside. Conversely, you’ll also need to secure your household goods so they don’t shift and damage your vehicle. If you have a lot of household items, you may find that the vehicle takes up too much valuable space inside your shipping container. If you don’t have a lot of household items, you may find that it’s cheaper to ship your car separately so you don’t have to pay for an entire shipping container. As you can probably tell, I recommend shipping your vehicle separately. I don’t see any significant advantages to shipping your vehicle inside a container along with your household goods, but I do see plenty of potential pitfalls. To learn all about shipping your vehicle separately, check out my article on Shipping Cars to Hawaii. All your household belongings are packed into moving boxes or crates. Larger items such as furniture are wrapped to protect them from dirt and scratches. A shipping container is hauled by a big-rig truck to your old home, where it is unhitched from the truck and left on its trailer (approximately 4 feet off the ground). Your moving boxes, crates, and wrapped furniture are wheeled/carried up a ramp and loaded inside the container. NOTE: Shipping containers don’t usually come with a ramp, lift-gate, tie-downs, or packing materials, so make sure the movers you hire have all the necessary supplies and equipment. A 12-foot ladder is also very handy for loading items all the way to the top of the container. The big-rig truck comes back, hitches onto the trailer, and hauls the loaded container to the shipping port. At the port, your shipping carrier processes and loads your container onto the ship. The ship sails to Oahu. If necessary, your container is unloaded from the ship at the port in Oahu and transferred to an inter-island barge to sail to a neighbor island. Upon arriving at its final destination, your container is unloaded from the ship and processed by your shipping carrier. The container is loaded onto a trailer and hauled by a big-rig truck to your new home, where it is unhitched and left on its trailer. Your belongings are unloaded from the container, down a ramp, and into your new home. NOTE: Once again, you’ll need to get a ramp, and a 12-foot ladder will make unloading easier. All your moving boxes and crates are unpacked, and your furniture is unwrapped and moved into place. The big-rig truck returns to pick up the empty container and hauls it back to the shipyard. BBB Rating A+ (BBB-accredited) A+ for North Carolina headquarters. (This rating seems overly harsh, considering there are only 2 complaints filed for such a high-volume business.) F: Failed to respond to 2 out of 5 complaints in the last 3 years. Can Arrange Container Transport Between Old Home & Departure Port? Yes, from anywhere in the U.S. mainland, Canada, and Mexico. Or you can hire your own truckers (they must be UIIA-approved). Yes, from virtually anywhere in the world. Or you can hire your own truckers. NA (However, they can pick up vehicles from any residence on the U.S. mainland, Oahu, or Maui) No. You must hire your own truckers. Can Arrange Box-Packing Service? No. You must hire your own packers. Yes. Or you can hire your own packers. NA No. You must hire your own packers. Can Arrange Container-Loading Service? No. You must hire your own movers. Yes. Or you can hire your own movers. NA No. You must hire your own movers. Number of Days You’ll Be Without Household Items or Vehicle From the West Coast: 6-21 days, depending on the departure and arrival ports. From Alaska & the West Coast: 6-28 days, depending on the departure and arrival ports. From the West Coast: 13-18 days, depending on the departure and arrival ports. Can Arrange Extended-Storage Services? No. You must hire your own storage service. Yes. Or you can hire your own storage service. Yes. Or you can hire your own storage service. No. You must hire your own storage service. Can Arrange Container Transport Between Arrival Port & New Home? Yes. Or you can hire your own truckers (they must be UIIA-approved). Yes. Or you can hire your own truckers. NA (However, they can deliver vehicles to any residence on Oahu or Maui) No. You must hire your own truckers. Container-Unloading Services Available? No. You must hire your own movers. Yes. Or you can hire your own movers. NA No. You must hire your own movers. Box-Unpacking Services Available? No. You must hire your own unpackers. Yes. Or you can hire your own unpackers. NA No. You must hire your own unpackers. Book your shipment through a freight forwarder (if you’re using Horizon Lines, they can make the arrangements for you). Post a notice on a forum like City-Data.com asking if anyone else who is moving around the same time on the same shipping route wants to share a shipping container with you. If you find a taker, you can then book a FCL (full container load) shipment with Matson or Horizon and split the cost. Because freight-forwarding companies book shipments in high volume, they get discounted rates, and can pass on some of their savings to you. This is how they can offer lower shipping rates than if you booked directly with a shipping carrier. Another advantage to using a freight forwarder is that you can ship LCL cargo, since they are in the business of consolidating freight and shipping in high-volume batches. They’ll palletize all your items together, measure the dimensions and/or weight, and charge you only for the space that your belongings will take up in a shipping container. The downside to using a freight forwarder is that it might take longer for your shipment to reach its destination. This is because the freight forwarder won’t ship your stuff until they’ve gathered enough additional cargo to qualify for the high-volume discounted shipping rate. Honolulu Freight Service – Located in Washington, Oregon, California, Illinois, and Oahu. BBB rating: A+. Has also earned several positive reviews on Yelp regarding their Honolulu, San Leandro (CA), and Montebello (CA) locations. DHX: Dependable Hawaiian Express – Located throughout the Asia-Pacific region and in Puerto Rico. BBB-accredited. BBB ratings: B+ for California location, A+ for Hawaii location. Hawaiian Ocean Transport – Located in California, Washington, Hawaii, and Guam. BBB rating: A+. If you’re looking for something more secure than palletizing and shrink-wrapping your LCL cargo, a shipping “cube” might be just the answer. It’s basically a mini shipping container that you can lock. The cube is dropped off at your home just like a regular shipping container, except it sits right on the ground, so no ramp is needed to load items into it. After the cube is all loaded up, the company picks it up and hauls it to the port, where it’s put inside a regular shipping container with other cargo that’s going to Hawaii. Upon arrival, your cube is hauled to your new home and dropped off so you can unload it. After it’s emptied, the company picks it up and takes it away. Cubic foot per cubic foot, a shipping cube is definitely more expensive than a regular shipping container. However, if you don’t have enough stuff to fill a regular shipping container, the total cost of a shipping cube service might be less costly than the total cost of a full-sized shipping container. There’s no denying that it’s a convenient service — like a freight forwarder, it allows you to ship LCL cargo, and some shipping cube companies also offer loading and packing services, just like a full-service moving company. ABF U-Pack Moving: ReloCube: BBB-accredited. BBB rating: A+. Has earned many positive reviews on Yelp and in online forums. Their website has helpful info on using their services to move to Hawaii. PODS – BBB-accredited. BBB rating: A+. Has earned mixed reviews in online forums. Full-size moving companies can take care of your entire move to Hawaii for you. For a premium price, they can pack, load, transport, ship, deliver, unload, and upack all your household items from your old home to your new one. They hire third-party companies (like trucking companies and shipping carriers) to handle any services that their own employees don’t cover. The full-service moving company acts as a sort of “project manager” for your entire move, which relieves you from having to coordinate several different service providers to cover all parts of your move. The downside to using a full-service moving company is that it may take longer to resolve any problems that might arise, because you’re not dealing directly with any third-party service providers that they’ve hired. You also don’t usually have control over which third-party companies they use. Most full-service moving companies will let you pick and choose which services you want. You don’t necessarily have to hire them to handle every part of your move. For example, you might pack your own moving boxes, and then hire the moving company just to load the boxes into a shipping container and take it to the port. M. Dyer & Sons (based on Oahu) – BBB-accredited. BBB rating: A+. Has earned positive reviews in online forums. Has also been named on annual award lists such as the Star-Advertiser’s “Best of the Best,” Honolulu Magazine’s “Best of Honolulu,” and Pacific Business News’ “Best in the Business.” Can handle local, inter-island, mainland-to-Hawaii, and international moves. Also offers custom-crating services. Pacific Transfer (based on Oahu) – BBB-accredited. BBB rating: A+. Earned a positive review on Yelp. Agent for Atlas Van Lines International. In business since 1978. Can handle local, inter-island (no vehicles), mainland, and international moves. Services all Oahu military bases. Town & Country Moving & Storage (based on Oahu, Big Island, Maui) – BBB-accredited. BBB rating: A+. Military-approved. Have agents on Molokai and Lana’i, too. In business since 1986. Can handle local, inter-island, and mainland moves. Also offers storage service. Kona Trans Moving & Storage (based in Hilo & Kailua-Kona on Big Island) – No BBB rating, but recommended in online forums. In business since 1939. Can handle local, inter-island, and mainland moves. Can handle moving fragile antiques and pianos. Other services offered: Custom crating, climate-controlled storage, and container-hauling. HITCO Moving & Storage (based in Hilo and Kailua-Kona on Big Island) – BBB-accredited. BBB rating: A+. In business since 1921. Can handle local, inter-island, mainland, and international moves. Also offers container-hauling service. Akamai Movers (based on Oahu) – BBB-accredited. BBB rating: A. Can handle local, inter-island, and mainland moves. Also offers climate-controlled storage service. Mountain Movers (based on Maui) – BBB rating: A+. Can handle local, inter-island, mainland, and international moves. Aloha International Moving Services (based on Oahu and Kauai) – BBB-accredited. BBB rating: Not available. Earned a positive review on Yelp. Online forum reviews are mixed. Can handle local, inter-island, mainland, and international moves. Also offers storage service. Island Movers (based on Oahu and Maui) – BBB-accredited. BBB rating: A+. Reviews on Yelp and Citysearch are mixed. Can handle local, inter-island, mainland, and international moves. Also offers storage service. Royal Hawaiian Movers (based on Oahu, Maui, Kauai, Hilo, and Kailua-Kona) – BBB-accredited. BBB rating: A+. Earned several negative reviews on Yelp and mixed reviews on Citysearch. Can handle local, inter-island, mainland, and international moves. Also offers storage and container-hauling services. In business since 1982. Unlike full-service movers, these companies don’t do it all — but that can be a good thing if you’re trying to save money. If you just need some strong backs to load and unload your shipping container, these guys can get the job done at a fair price. A couple of them can also haul a shipping container between the Oahu port and your home. 2 Guys & A Truck (Oahu only) – BBB-accredited. BBB rating: A+. Has earned several positive Yelp reviews. In business since 2001. Offers trucking and container loading/unloading service — on Oahu only. Does not offer container transport or packing/unpacking service. Johnny The Mover (Oahu only) – BBB-accredited. BBB rating: A+. Has earned positive reviews on Yelp. Offers trucking, container transport, container loading/unloading, and box packing/unpacking services — on Oahu only. Hawaii Piano & Household Moving (Oahu only) – BBB rating: A+. Reviews on Yelp and Citysearch are mostly positive. Offers trucking, container transport, and container loading/unloading service — on Oahu only. Does not offer packing/unpacking service. Just in case you were thinking of using any of these companies… I don’t recommend it. Express Movers (based in Hawaii) – BBB rating: F.
Guardian Cargo Logistics, aka Guardian Moving & Storage, Guardian Shipping & Moving (based in Hawaii, Canada) – No BBB rating, but has earned a bad reputation in online forums. Pacific Island Logistics and Storage (based in California) – BBB rating: F. “Hawaii News Now” reported numerous complaints. No longer in business? United Aloha Movers (based in California) – BBB rating: F.
West Point Relocation, aka Global Shipping (based in Hawaii, California) – BBB rating: F.
Media Mail – This dirt-cheap rate can be used only for sending books, DVDs, CDs, and certain other media (sorry, no video games or magazines). And yes, they will open up your boxes to check to make sure that’s all you have in there. Parcel Post – For all your belongings that don’t qualify for Media Rate, Parcel Post is your next cheapest rate. But be warned: Packages sent via Parcel Post to Hawaii typically take 4 weeks (some have been known to take up to 8 weeks) to reach their destination. After weeks in-transit on trucks and boats, your package will probably arrive looking pretty beat-up. So make sure you use a sturdy box, packing material, and lots of tape. If the items you’re sending are irreplaceable or particularly valuable, don’t risk sending them on the long, rough Parcel Post journey — use Priority Mail instead (see below). Priority Mail Flat Rate – Because it’s based only on volume and not weight, Priority Mail Flat Rate is ideal for sending small-but-heavy things that will fit inside a Flat Rate box. And because the rate remains the same no matter where you send the package (as long as it’s within the U.S.), it’s especially great for sending things long distances — like to Hawaii. Priority Mail – If your items won’t fit in a Flate Rate box, then regular Priority Mail (priced by weight and box dimensions) is your next best option. Another reason to consider using USPS: If you don’t have a mailing address in Hawaii at the time you want to start sending your packages, you can send them via General Delivery to the main post office in the city/town you’re moving to. They’ll hold the packages there for up to 30 days at no charge. Although it may sound funny, there is UPS and FedEx “Ground service” to Hawaii (although there’s no underwater tunnel involved!). Ground service is the cheapest that UPS and FedEx offers, and will deliver your packages from the U.S. mainland to Hawaii in just 3-6 days. However, unless you have access to UPS or FedEx corporate rates (which are substantially discounted), the cost is approximately twice that of USPS Priority Mail. FedEx is slightly cheaper than UPS. If you’re shipping inter-island only, another option to consider is Aloha Air Cargo (although they don’t fly to Molokai or Lana’i). In addition to their next-day service, they offer a discounted Aloha FlexShip service, which has a transit time of 3-5 days. 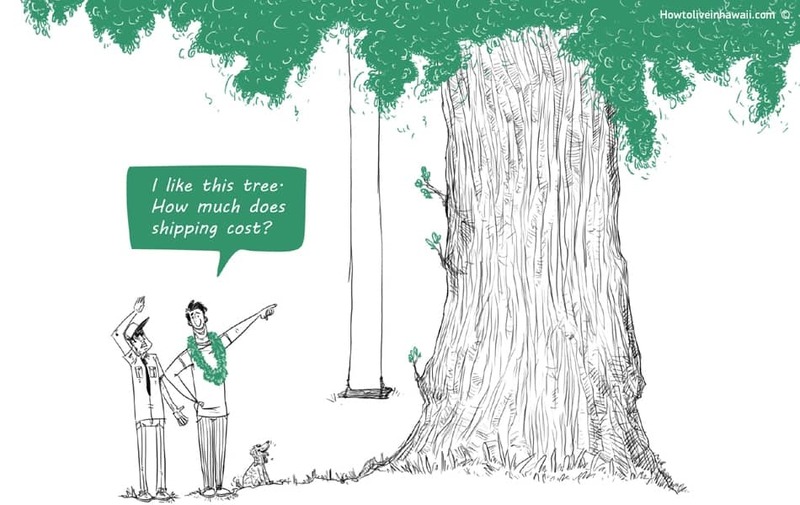 Aloha FlexShip requires a minimum order of $90, and your shipment must be palletized. Hawaiian Airlines Cargo and Island Air also offer air transport services, but only to “known shippers.” However, if you have a business and don’t mind going through an application process, those are two other options. One last shipping method to consider is to check in your packed household items as baggage on your flight to Hawaii. This can be a particularly cost-efficient method for odd-sized items such as bicycles, surfboards, and large musical instruments. Unless specified otherwise, prices below are for items being sent from ZIP code 94086 (Sunnyvale, CA) to 96821 (Honolulu, HI). NA = not applicable; ‘ = feet; “ = inches. Watch out for USPS media mail, as it is extremely unreliable. I mailed a 35 pound box of books FROM Honolulu to the mainland in early December, and it never arrived. USPS has a delivery estimate on their website, but it is inaccurate, to say the least. In addition, now that the airlines all charge for checked baggage, there are no freebies anymore…unless I travel via cruise ship (no baggage charges there). Thanks for sharing your experience with using USPS Medial Mail service. Sounds like it’s just as unreliable as Parcel Post! Good to know. Parcel post gets there faster.. Media mail between Hawaii and the mainland can take up to 8 weeks. Parcel Post usually gets to its destination in 3 weeks. Regarding pasber’s comment: USPS Media Mail IS extreamly reliable. I suggest you purchase USPS Delvery Confirmation for each shipment and then you can “track” each one. I have yet to have a USPS Media Mail shipment not arrive. Perhaps you were just to impatient. Thank you for sharing your experience with using Media Mail. Sounds like it’s a viable option, as long as you’re willing to wait for delivery. That’s good to know that you can track the package using Delivery Confirmation. Thank you for putting all the shipping into one place, this makes my life so much easier! I am dreaming about eventually moving to either Maui or the Big Island. Where would you buy big ticket items such as a flat screen tv and furniture (including matresses) and what kind of price difference is there between Hawaii and the Mainland? You can buy big-ticket items on Maui or the Big Island at Walmart, Target, Kmart, Costco, Macy’s, Sears, and locally owned businesses. The Hawaii-mainland price difference can vary greatly from store to store and when you buy it (if it’s on sale or not), but items can cost as much as 25% more in Hawaii. This is an EXCELLENT article, very very helpful. Thank you so much for putting this info together, Michele!!! This is an excellent website. This article in particular is very helpful. Thank you. Glad my site is helpful to you! If it’s any comfort to your wife, she’ll be a lot closer to Japan, if she still has family back there that she visits on a regular basis. And her language skills will definitely help her find a job in Hawaii, too — Japanese-speaking employees are almost always preferred. What are your wife’s specific concerns about living in Hawaii? Why does she think she might hate living here? Thank you so much for your informative and helpful site! I am moving to Oahu in June and have very little to bring with me, so I have been deliberating on how to get my things there. This website is exactly the kind of help I have been looking for! If I think it can be of help to anyone else, I’ll post my inventory weight and volume along with the price once I get it all moved. Thanks again! Good luck with your move in June! P.s. I love how you did the price comparison chart, too! This is so nice of you to take the time to write this up for everyone! Thanks for such kind words — I’m glad the info was helpful to you! I’m glad you’ve found my site helpful, although I totally understand how knowledge can sometimes just add more options to consider in your decision-making process, which makes decision-making all the more complicated! At least you have your dog’s paperwork on track — that’s a major accomplishment in itself. Thanks for such good info. I own a soap and candle business and was wondering how to get my business inventory to Kauai in Oct. this will help us out so much. Glad I could help! And thanks for posting your own price comparisons — that’s useful info for others to see. 1) How will you drive the truck in/out of the container? Shipping containers are usually on a trailer that’s several feet off the ground. You would probably need some secure sort of ramp. 2) How will you anchor the truck within the container so it doesn’t shift inside the container while at sea? Is setting the parking brake enough? There is probably some way to “tie down” the vehicle — I’m just not familiar enough with the process. Just make sure you ask the shipping company you plan to use about both of these issues before booking anything. Just as an FYI, when we moved all our stuff from Alaska to the lower 48, we used Horizon. We put our car in with our household goods in a 40′ trailer. What we did was hire a tow truck company that had a flatbed. Drove the car onto the flatbed, raised it up, and drove the car into the container. Then reversed the process when we got to our new place. It only cost us about $75 on each end. We bought industrial 10,000 lb ratchet tie-down straps to secure the car. The inside of Horizon’s container had tie-down loops every 4 feet that we could hook to. Everything made it safe and sound after being shipped by train to Anchorage, by boat to Washington, and by train/truck to our new home. I would think the same thing would work going to Hawaii. This is really useful info — thanks so much for sharing! Aloha! Thank you for all your time and effort to put this sight together. So much useful info – really helpful. Love your website, a lot of useful information. Thank you. We are preparing to move to Kailua-Kona and so confuse of what to do. We have enough furniture and other household items to fill a 20-foot container. If we get a 20-foot container, how will it move from the port to the house? Any suggestion? When you book your shipping container, it usually includes transporting it (on a trailer pulled by a semi-truck) between your home and the port. What it might not include, however, is a ramp to move items into and out of the container (since the container always remains on the trailer, which is several feet off the ground). So when you contact Matson, Horizon Lines, or the moving company you’re going to use to book your shipping container, just make sure to ask them what’s included.